Look! It's HG's favorite recipes...Weeeee! 1. Fettuccine Hungry Girlfredo - HG's most popular recipe ever. It's her 80-calorie Fettuccine Alfredo swap! 2. 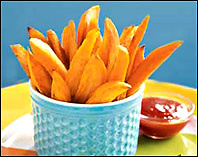 Butternut Squash Fries - The best french fry swap on the planet...hands down! 3. Pumpkin Dessert Recipes - This email was our most popular dessert recipe email ever. Check it out and you'll know why. 4. Smoothie Central: Smoothie Recipes - If you like smoothies, you'll flip over HG's frosty treats! 5. Pina Colada Recipe - The world's first and best 100 calorie frozen ice cream pina colada! 6. Rockin' Breakfast Recipes - Running out of ideas for yummy, guilt-free b-fasts? Check these out. 7. Rockin' Shirataki Noodle Recipes - Love tofu shirataki noodles? Don't miss this email with fun ways to prepare 'em. 8. Starbucks Swap: Strawberry Cloud - <?fontfamily><?param Geneva>If you're a fan of Starbucks' over-caloried Strawberries & Creme Frappuccino, check out HG's version, which has a fraction of the fat and calories.<?/fontfamily></span></TD> <TD width=40></TD> </TR><TR> <TD colSpan=7 height=20></TD></TR></TABLE></TD></TR> </TABLE></TD> </TR> </TBODY></TABLE></TD></TR> <TR><!-- template listing --> <TD vAlign=top width="100%" colSpan=2> <TR> <TD bgColor=#b56793 colSpan=2 height=1></TD></TR> </TD><!-- end template listing --> </TR> <TR> </TR> <TR> <TD vAlign=top width="100%" colSpan=2><br/></TD></TR> <TR> <TD vAlign=top align=middle width="100%" colSpan=2> <TABLE cellSpacing=0 cellPadding=0 width=550 border=0> <TBODY> <TR> <TD width=26><IMG height=22 src="http://www.hungry-girl.com/html/images/thursday_corner01.gif" width=28></TD> <TD background="http://www.hungry-girl.com/html/images/thursday_corner_bg03.gif" bgColor=#F5E7EF></TD> <TD width=26> <DIV align=right><IMG height=22 src="http://www.hungry-girl.com/html/images/thursday_corner03.gif" width=29></DIV></TD></TR> <TR> <TD background="http://www.hungry-girl.com/html/images/thursday_corner_bg01.gif" bgColor=#F5E7EF></TD> <TD bgColor=#F5E7EF><SPAN style=" COLOR: #000000; FONT-SIZE: 13px; FONT-FAMILY: Palatino Linotype, Georgia, Times New Roman;"><SPAN style=" FONT-WEIGHT: bold; COLOR: #000000; FONT-SIZE: 13px; FONT-FAMILY: Palatino Linotype, Georgia, Times New Roman;">CHEW ON THIS:</SPAN><BR>Today, March 2, is National Banana Cream Pie Day. Check out HG's 143-calorie Topsy Turvy Banana Cream Pie recipe. Share these recipes with everyone in your address book who likes to eat. Click "send to a friend" NOW!